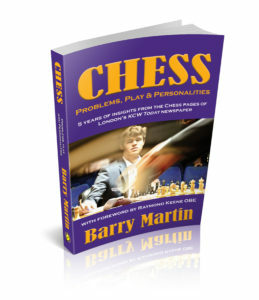 The new book, ‘Chess – Problems, Puzzles, Personalities,’ by AICA member Barry Martin, has been published by Filament Publishing, London. It comprises a compilation of articles the author contributed to The Kensington, Chelsea and Westminster Today newspaper over a period of five years, looking at chess and culture. There are art relationships contained in the chapters for those less inclined to chess, with Duchamp of course being mentioned. The launch is also timely as London is currently hosting the World Chess Championship at what was the old Central School of Arts and Crafts building in Holborn.